At its meeting this past Tuesday, the City Council voted unanimously to oppose the transport of hazardous crude oil by rail. This was in response to a Phillips 66 proposal to process Bakken crude at its Santa Maria Refinery in San Luis Obispo. Bakken crude comes from the massive Bakken shale formation which underlies parts of North Dakota, Montana, and Canada. This formation has proven to be an incredibly abundant source of oil. So prolific, in fact, that production greatly exceeds existing pipeline capacity for transporting it to refineries. Consequently, suppliers have turned to railways as a means of picking up the slack. Oil tank rail cars used to move crude to refineries. One railway that could be used to deliver Bakken oil to the San Luis Obispo refinery is the Union Pacific line that traverses right through the heart of Hayward. The concern is that transporting oil this way, particularly Bakken crude, can be incredibly dangerous. Reasons for this include the sheer volume of oil that is typically moved in each shipment, the hurried pace by which shipments are apparently being made throughout the country, and the questionable containment integrity of existing tank cars. Moreover, Bakken oil has been found to be considerably more flammable and explosive than other types of crude. It was Bakken oil that caught fire and exploded during a train derailment at Lac-Mégantic, Quebec in July 2013. That disaster spilled 1.5-million-gallons of oil, destroyed half of the city’s downtown, and killed 47 people. The ongoing recovery cost is expected to climb as high as $2-billion. While the Quebec catastrophe is undoubtedly the most infamous incident so far, it is by no means the only one. Numerous railway tanker accidents have occurred across North America within the past 9-months, including in North Dakota, Alabama, and Alberta. Could a similar one happen right here in Hayward? Absolutely. In fact, multiple derailments (not including oil tankers) already have. In 1980, a freight train derailed while crossing the Industrial Parkway overpass. Seven freight cars derailed, the locomotive was destroyed, and two train crewmembers lost their lives. Damage was estimated to be over $1.3M. Train derailment at Industrial Parkway overpass in Hayward (1980). In 2002, an Amtrak Coast Starlight derailed near Baumberg Avenue and Industrial Boulevard. A locomotive and five passenger cars left the tracks. What might the consequences be of a Hayward train derailment that involves oil tank rail cars carrying Bakken oil? In a staff report to Council, Fire Chief Garrett Contreras detailed a scenario where only one tank rail car (of what could be as many as one hundred) explodes. The result is not pretty. 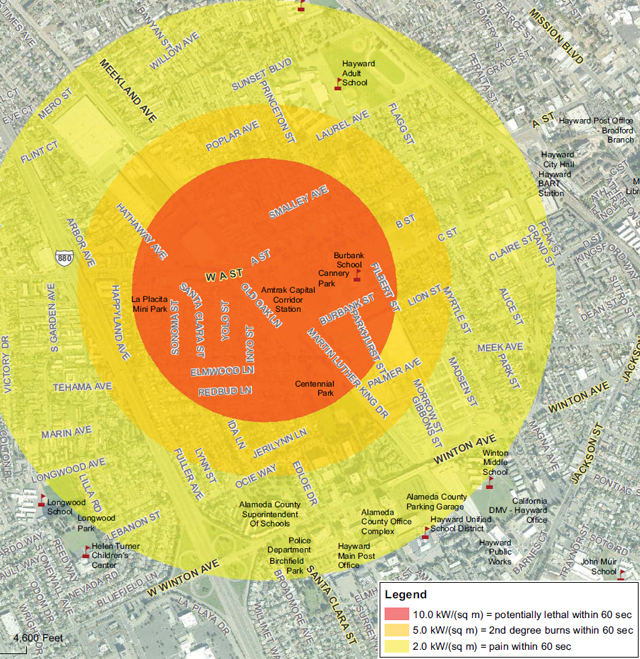 The hypothetical explosion, centered at the Hayward Amtrak Station (as shown in the figure below), would potentially be lethal over a radius of a third of a mile. This deadly blast zone includes the Burbank Elementary School, numerous parks, and scores of residential structures. Outside the immediate blast zone, burns and other painful effects might be felt as far away as three quarters of a mile. Given Hayward's history of train derailments, the possible tragic consequences of an accident involving Bakken crude, and the tremendous political power of the oil and railroad industries, the Council is absolutely correct in taking a strong, early stand against this potential threat. Kudos to the Council and City Staff for monitoring the situation and getting out in front of it. The Council resolution approved on Tuesday night authorizes and directs staff to advocate the issue at both the local and national levels. What upsets me about this is that we were not given any prior notice, that the railroad and the oil company can do whatever it wants in our community without having to take us into consideration. They should have done an environmental study. It appears that the railroads really don't want the public knowing about these rolling bombs. Check out the letter sent to CalOES as provided in this KQED article. When I heard it on the news, my brother and I drove there to see it. We walked to the overpass and saw the engine laying on its side on industrial pkwy. It wasn't until later we learned there was a caboose under the engine with two men. I feel sorry for those guys. The caboose was flattened and the fire was so hot they let it burn itself out. I guess there wasn't much left of them. Measure C - Vote No Before We're All Cooked!